Several studies reveal, the routine of eating nuts can increase life expectancy. This is supposedly because the benefits of beans in lowering the risk of death from specific diseases. Almost all types of nuts have similar benefits for health. Nuts contain unsaturated fatty acids, and various nutrients in it can support the body's health. Arginine is an amino acid needed to produce nitric oxide. Function of nitric oxide is to widen blood vessels. In other words, arginine may help the arteries more elastic, and reduce the risk of the formation of blockages in blood vessels. Sterols can help reduce cholesterol levels in the blood. Other products, such as margarine, sterols is often added to make it more healthy, but nuts already contain sterols are naturally. One of the benefits of fiber for health is to make you feel full longer, so it could help efforts to lose weight. Another benefit is the possibility it could help prevent diabetes and balance the cholesterol levels in the blood. This is a substance that can help nourish the heart. Omega-3 fatty acids may help prevent the onset of a heart attack. Blood vessels can be narrowed if there is a build-up of plaque. This will increase the risk of coronary heart disease and heart attacks. Vitamin E in nuts can lower the risk. Despite the many benefits that are good for the health of the body, the consumption of beans should still be restricted. 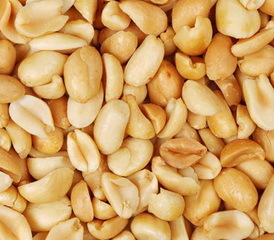 About 80% of the fat content of peanuts are good, but also contains high calories. The recommended amount is about a handful of small nut or two spoons of peanut butter that can be used in lieu of a group of foods that contain saturated fats, like eggs, milk, and cheese. There are two types of beans, namely nuts that grow on trees and bean that grows in the ground. The beans grow on trees e.g. almonds, walnuts, cashews, Pecans, pistachios, and walnuts. Nuts that grow on the ground, an example are peanuts. By consuming walnuts, you can get a lot more antioxidants, because of the high content of vitamin E in it. Some other types of beans have only half the content of antioxidants than walnuts. If you are undergoing weight loss program, it is recommended to eat almonds. Almonds make you feel full quickly thanks to the fiber, fat, and protein it contains. The type of fat in nuts is also similar to that found in olive oil, namely monounsaturated fats. The benefits of this substance are said beneficial for maintaining heart health. Pecan contains the most antioxidants when compared with other types of nuts. The amount of vitamin content is also high, reaching 19 vitamins. The benefits of these nuts can slow the disease of Lou Gehrig, a degenerative neurological disease. The type of bean is very good for lowering cholesterol levels in the blood because it contains substances that can increase the levels of antioxidants in the body, among other gamma tocopherol, beta carotene, and lutein. In addition to lowering levels of LDL cholesterol, known as evil, pistachios are also good for maintaining healthy eyes and skin. Although different from previous types of nuts, peanuts are also great benefits because of the content of protein and unsaturated fats in it are good for heart health. Almost all types of nuts including nuts that grow on the soil have a relatively equal nutritional content. To note is that you are advised to consume nuts without any addition. The benefits of nuts are not optimal when you add salt, sugar, or chocolate. In addition, it is recommended to more closely look at peanut processing. A study revealed that eating a lot of fried foods would be bad for health, that cause high cholesterol, obesity, high blood pressure, and heart disease. Even though it is still observed, however it is recommended that you fry using olive oil, which is expected to protect heart with content of antioxidants. Not a few of the benefits of beans that can be obtained for health. Nevertheless, keep note the amount you consume. If you have a specific health condition, we recommend consulting a doctor for the right amount of consumption.